Why Go to Lisbon? Learn why Lisbon is one of the hottest cities to visit! Why go to Lisbon? Lisbon has everything you are looking for – there are a tons of spectacular viewpoints, gourmet restaurants, art, museums, historical sites. There are also many options for fun trips just outside the city. Lisbon is Portugal’s charming and lively capital which has embraced authenticity and passed on building stuffy skyscrapers. Check out the great selection of Travel Honey LISBON ITINERARIES & GUIDES with tips on when to go how and how long to stay. See TAP Airlines if you want cheap direct flights to Lisbon from the U.S. You won’t lose a day traveling if you do an overnight flight there and a late afternoon flight home because of the time change. From the airport, you can take the Aerobus (3.60 euros), which leaves about every 10 minutes and takes you to the city center; a taxi (about 20 euros); an Uber (10-15 euros but it varies); or you can schedule a pick-up from your hotel. Try to walk as much as possible to really experience Lisbon. But there are many steep hills, so Ubers, taxis, tuktuks and trams are all good options, especially to Belem and the Alfama. Taxis and tuktuks are the most expensive options. Ubers are very cheap and their drivers are most likely to speak English. The trams are a good experience, but they can get crowded. WHY GO TO LISBON? THESE AMAZING PLACES TO STAY! If you want to be in the heart of Lisbon near most bars and restaurants, stay in Barrio alto, Chiado or Baixa. If you want something quieter with good river views, try Alfama. Be warned, Lisbon is full of steep hills, so the farther you are from the river to the north and east, the longer your uphill walk will be (or take advantage of the trams or cheap Ubers!). Hotel Barrio Alto ($$$$) Luxury boutique hotel in the center of Barrio Alto and a stunning terrace and rooftop bar. Residentas Atalaia ($$) A cute, spacious apartment in Barria Alto. Beautique Hotels Figueir ($$) A boutique hotel with small but stylishly decorated rooms in an excellent location close to the Baixa-Chiado subway stop. Memmo Alfama ($$$) A delightful and serene boutique Design Hotel with small bright rooms, wonderful service and a stunning view from the pool. H10 Duque de Loule ($$) A little bit outside the city center, this brand new hotel on the northern edge of the city center with modern rooms and stunning rooftop bar. WHY GO TO LISBON? THESE AMAZING PLACES TO EAT! A Cevicheria ($$$) A trendy spot in north Barrio Alto with delicious (mostly seafood) dishes that are meant to be shared. It’s a cool scene that is popular with the locals. Cervejaria Ramiro ($$$) Made famous by an Anthony Bourdain episode, you order amazing seafood by the kilogram. A little outside the city center. Cantinho Do Avillez ($$$) A cozy Chiado favorite making creative and affordable dishes. Famous Michelin starred chef. O Prego da Peixaria ($$) A popular sandwich shop in north Barrio Alto with cool decor, communal tables, excellent wait staff and amazing sandwiches and burgers. Good for lunch. Bistro 100 Manieras ($$$) A winning combination of high quality service, fine dining, creative dishes and a fun atmosphere in Chiado. Os-Gazeteiros ($$) A hidden gem in the Alfama with a stylish interior and an imaginative, tasty and reasonably priced set menu. Caso Serio ($$) A cozy, hip restaurant that’s an well-priced, tasty option in Alfama. Time Out Market ($$) A happening, high-ceilinged warehouse with communal seating and food stalls along the edge from many Lisbon restaurants (including a few Michelin stars). In Cais Sodre. WHY GO TO LISBON? ITS AMAZING NIGHTLIFE! Barrio Alto and Cais Sodre are where you’ll find Lisbon’s nightlife. We recommend a rooftop bar for pre-dinner drinks, and a late dinner, so you can make it past 12am when things really get started. Barrio Alto Hotel’s Rooftop Bar ($$) A stylish rooftop bar in the Barrio Alto with great views of Lisbon. Go at sunset. Entretanto Rooftop Bar in Hotel do Chiado ($$) A rooftop terrace drink and oyster bar with great views of Sao Jorge Castle. Go at sunset. Procopia ($$) A cool, relaxed, speakeasy-type bar tucked away in a nice neighborhood north of Barrio Alto. Go before or after dinner. Pensao Amour ($$) Located in a former brothel, this bar is funky cool and has an awesome 90s playlist. On Lisbon’s famous Pink Street in Cais do Sodré near the Time Out Market. Go after midnight. Park Bar ($) A hip bar on top of a car park with amazing views and a great DJ. Go at sunset or after midnight if you want to dance. Tasca Bela ($) – Where to go for authentic Fado music in the Alfama. It’s also a restaurant, so go after dinner. Lisbon provides easy access to great day or overnight trips. Why go to Lisbon? To explore more beautiful beaches of Cascais, about a 30 minute drive west of Lisbon. It’s also possible to arrive by a relatively quick train or taxi ride. After catching some waves, take a walk around the cobblestone streets of the historic village center. 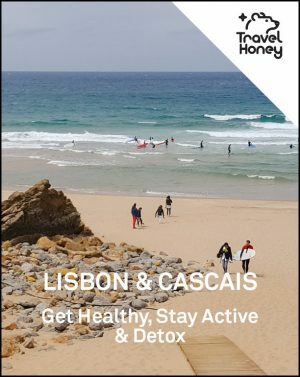 Check out this Travel Honey Itinerary and get the inside scoop on some of Cascais’ amazing activities and great places to stay, eat and drink. In addition, we’ve listed a few lodging, eating and drinking ideas below. Senhora da Guia Cascais Boutique Hotel ($$$) Romance, floral patterns and seaside ambiance. Relax in the spa, sauna and Turkish baths. Farol Design Hotel ($$$) Lounge on the sun deck overlooking the Atlantic Ocean and watch the hotel DJ spin during sunset. Design oriented luxury. Casa Vela Charm Guest House ($$) Colorful and charming guest house minutes away from the beach with a delicious breakfast buffet. Fortaleza do Guincho ($$$$$) Views of the ocean with a Michelin star. The restaurant is located in a 17th century fortress. Cervejaria Luzmar ($$) Exceptional quality seafood, try the fish baked in salt and indulge in the presunto beforehand. Conceito Food Store ($$) Contemporary, locally sourced Portuguese food served in an all white setting. Why go to Lisbon? To wander the palaces and castles of Sintra, just a 40 minute drive, Uber or train from Lisbon. If you have time, or you’re continuing north to Porto or the Douro Valley, stay the night. Check out this Travel Honey Itinerary and get the inside scoop on Sintra’s amazing castles and palaces. We’ve listed additional recommendations for lodging, eating and drinking below. Tivoli Palacio de Seteais ($$$$) Stay in an elegant converted castle and enjoy excellent service and breathtaking views. Aguamel Guest House ($$) A cute, boutique hotel about a five minute walk into the heart of Sintra. Chalet Saudade ($$) Enjoy newly renovated rooms in an old mansion with gorgeous high ceilings. A short walk to the train station. Café Saudade Café ($$) A sweet cafe with a good selection of delectable pastries, sandwiches, and salads. Loja do Vinho ($$) A wine bar in the center of Sintra that’s great for a pre-dinner drink and a plate of tasty cheeses and cured meats. Incomum by Luis Santos ($$) High quality modern dishes at reasonable prices. Enjoy outdoor seating if the weather is nice. Caldo Entornado ($$) A cool, trendy place with great food. Casa Piriquita ($) To maximize your sightseeing time, grab a quick lunch at this tasty bakery. Why go to Lisbon? Because it’s just a quick jaunt to a hip beach! Hop in the car and drive 1.5 hours south to the beaches and fish shacks in Comporta. This place is for taking it easy and relaxing, so forget about rowdy nights. Casas Na Areia ($$$$) Designer’s weekend project turned small hotel. Stunning cottages with sand floors. Sublime Comporta ($$$) Simply divine! The most stylish digs in Comporta with an outdoor fire pit and lounge pool. Situated on a 17 acre estate of pine and cork trees. Museu do Arroz ($$$) A museum of rice with mouth watering dishes in a shabby chic setting. Sal ($$) Delicious seafood on a sandy beach. Lots of character and great place to start the afternoon with a bottle of rose. O Dinis ($$) Simple and happy fish shack on the beach. Prices are a steal. BEST INSTAGRAM ACCOUNTS FOR LISBON? More proof of why you need to go to Lisbon! 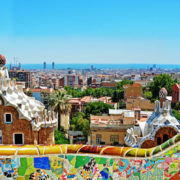 Check out these awesome itineraries from Travel Honey’s savvy contributors. Don’t see an itinerary that matches your travel needs? Let us know what you’re looking for by emailing support@travelhoney.com.